I’m celebrating independence and self-determination this 4th of July weekend by supporting some of my favorite small businesses and entrepreneurs in Seattle. On Saturday, July 2 from 11am -5pm, Chera Amlag and the Hood Famous Bakeshop crew will hold a dessert pop-up at The Station coffee shop on Beacon Hill. Chera is a woman after my own heart. She has combined two of my favorite things of all time: cheesecake and ube (a purple yam commonly used in Filipino desserts). Along with its classic ube cheesecake, Hood Famous will offer ube crinkle cookies, ube polvoron, and some new treats, including strawberry calamansi marshmallows and Vietnamese coffee cheesecake. Chera’s good friend and talented chef, Tarik Abdullah, will host his own sweet pop-up on July 3 from 5pm-9pm at Refresh Frozen Desserts and Espresso on Capitol Hill. The Rose & Blossom pop-up will feature Moroccan-inspired desserts and music by Proh Mic. Pursue some happiness this weekend by buying local sweet treats! Everyone at my office is sick, recovering from being sick, or like me, fighting like hell not to get sick. That’s why I made Filipino arroz caldo for dinner. 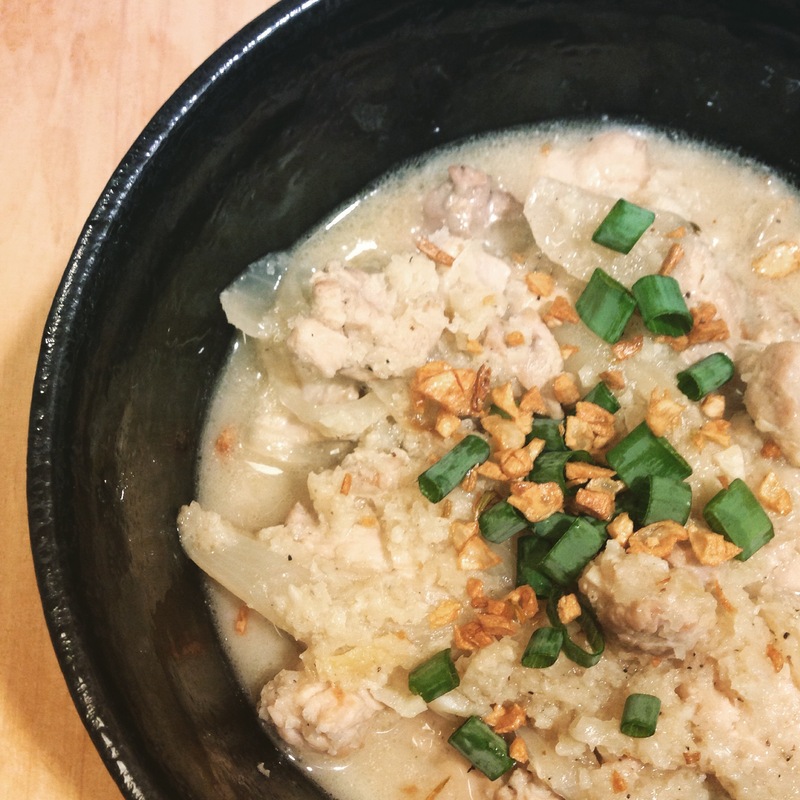 It’s traditionally a savory rice porridge with chicken, garlic, and ginger. I cooked a Paleo version using cauliflower rice, which is made by putting cauliflower florets in a food processor and pulsing until the cauliflower is the size of rice grains. My arroz caldo is inspired by Joshua Bozel’s recipe for Serious Eats and Mary J. Gines’s recipe for Fit Living Foodies. Heat 1/3 cup oil in small pan over medium heat. Add half of the minced garlic and cook until garlic turns light brown. Place garlic in fine-mesh strainer and drain. Then transfer to a paper towel-lined plate and set aside. In a large pot or Dutch oven, heat the remaining 1/3 cup oil over medium-high heat. When the oil shimmers, add the sliced onion and cook for 5 minutes until soft but not brown. Next add the rest of your garlic and ginger and cook for 1 minute more. Place chicken in pot and cook until no longer pink. Then add cauliflower rice, chicken stock, fish sauce, and lime juice. Bring to a boil and then lower heat and simmer for 15-20 minutes until it has reached your desired consistency. Add more fish sauce and lime juice to taste. Ladle arroz caldo into bowls and top with green onions and fried garlic. I don’t really write recipes–I’d rather spend my time cooking. But my friends Dawn and Helen asked me to put this one together. It’s inspired by RG Enriquez of Astig Vegan, a blogger you should definitely check out if you want to explore vegan and/or Filipino food. 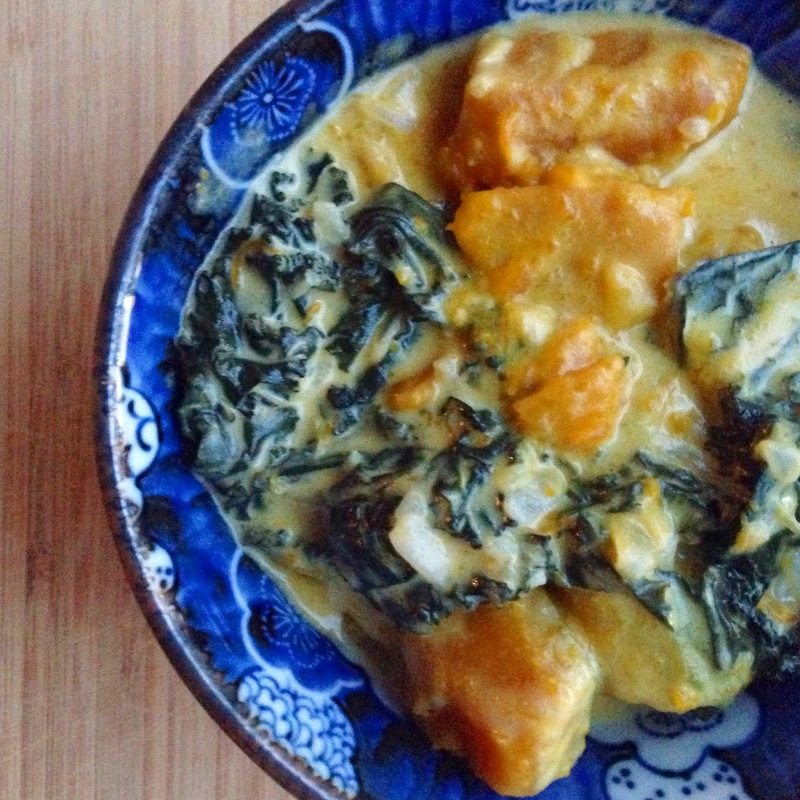 This recipe is vegan, but you could modify it to meet your dietary needs or taste preferences. It can stand alone as a main dish or as a hearty side. Eat it with rice and bagoong if you’re feeling Filipino. Melt vegan margarine over medium-high heat in a large saucepan or Dutch oven. Add chopped onion and cook 3-5 minutes until soft and translucent. Put in minced garlic and cook for another minute. Stir in kale and cook for 5 minutes until kale is wilted. Place chopped squash in pan, pour in coconut milk, and add salt and pepper. Bring to a boil, and then turn heat to low and simmer for 15-20 minutes, stirring occasionally. You’ll know it’s done when you can easily pierce the squash with a fork. Taste and add more salt and pepper to your liking. I’ve decided to join Kalsada Coffee’s mission to support Filipino coffee farmers and bring the Philippine coffee industry back to its former glory, one farm at a time. 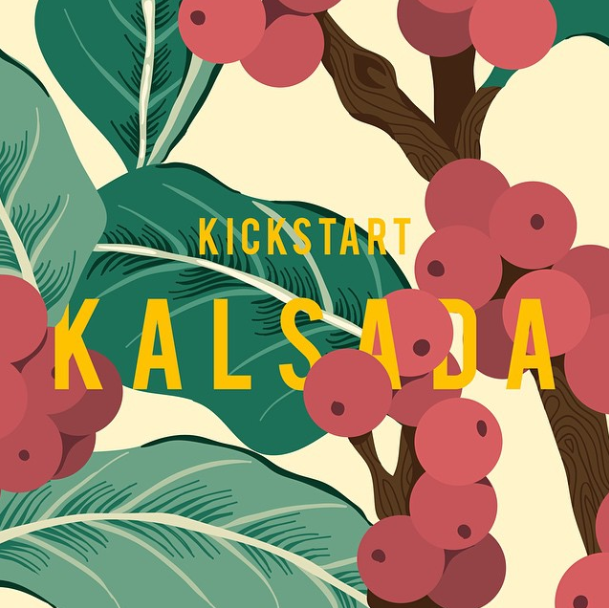 Kalsada Coffee is currently in Kickstarter mode and is 80% funded with less than 2 days to go. I invite you to consider backing this Kickstarter. You can find more info at kalsada.org. Salamat! A few weeks ago, an acquaintance of mine named Michael sent me a message asking if we could get together and cook. It was an unexpected and lovely invitation to connect. If you could eat one meal for the rest of your life, what meal would that be, why, who would make it, and who would eat it with you? My friend Laura posed this question as a writing prompt for National Blog Posting Month. I considered the memorable meals I’ve had in my life. I remembered beef bourguignon in France, a Cherry Fizz cocktail served tableside, salt and pepper pork chops. Geo, one half of Seattle hip hop duo Blue Scholars, is a fierce lyricist and tireless community activist. The man can also cook. 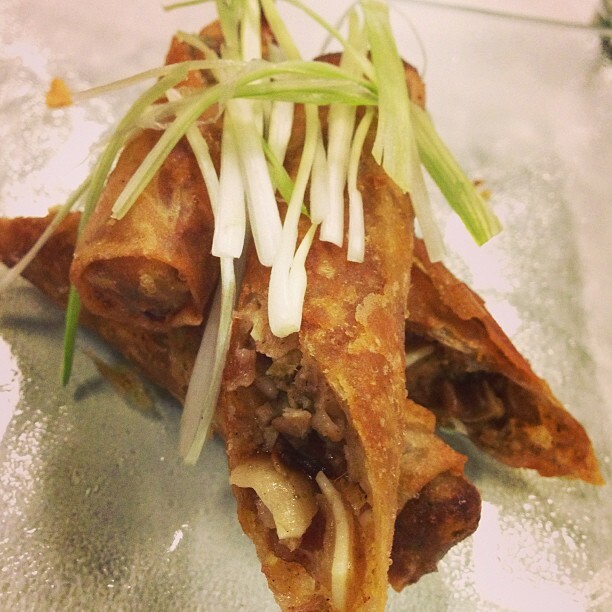 He and his wife, Chera, have started holding monthly pop up dinners called “Food & Sh*t” at Inay’s Asian Pacific Cuisine. The menus feature inventive riffs on traditional Filipino dishes and other dishes that reflect Geo’s background and his family’s personal tastes.